One of the most beautiful drives in the Smoky Mountains will be getting a major addition in the coming years! The Foothills Parkway is going to open a brand new 16-mile stretch of highway running from Walland, TN to Wears Valley, TN. Due to a variety of problems and delays, this section of the Parkway has been under construction for 50 years. Aunt Bug’s Cabin Rentals has all the details on this exciting news. The original plans for the Foothills Parkway, which were approved by Congress in 1944, called for a 72-mile highway running from Chilhowee Lake, TN to Cosby, TN. The scenic highway would trace the edge of the Smoky Mountains and offer stunning views of East Tennessee’s natural beauty. Construction on the Foothills Parkway in the late 1960s yielded two sections of the highway. The 5.5-mile segment of the road linking Cosby with Interstate 40 is known as “Foothills Parkway East”. On the other end, a 17-mile section of the highway connecting US 129 and Walland became “Foothills Parkway West”. After 20 years of work, this notorious 1.5-mile segment of the highway, which came to be known as the “missing link”, forced construction crews to give up in 1989. A more sporadic attempts at bridging the gap were made in the next two decades, but no substantial progress was made. In 2009, the dream of completing the long-delayed 16-mile section of the Foothills Parkway was reignited when federal stimulus money became available for the project. The extended hiatus in construction was actually a godsend, because bridge technology had made leaps and bounds in the ensuing years. New advances allowed construction crews to fill the “missing link” by building a bridge that “floats” around the edge of the mountain. Now that the “missing link” has been bridged, the National Park Service is in the process of paving the entire 16-mile section of the Parkway. Officials estimate that the new section will be open to the public around the winter of 2018-19. There will, of course, still be a 33-mile gap between Foothills Parkway West and Foothills Parkway East. However, the extension of Foothills Parkway West into Wears Valley is a major step towards completing Tennessee’s oldest unfinished highway project. We can’t wait to see the breathtaking mountain views from the new section of the Parkway! 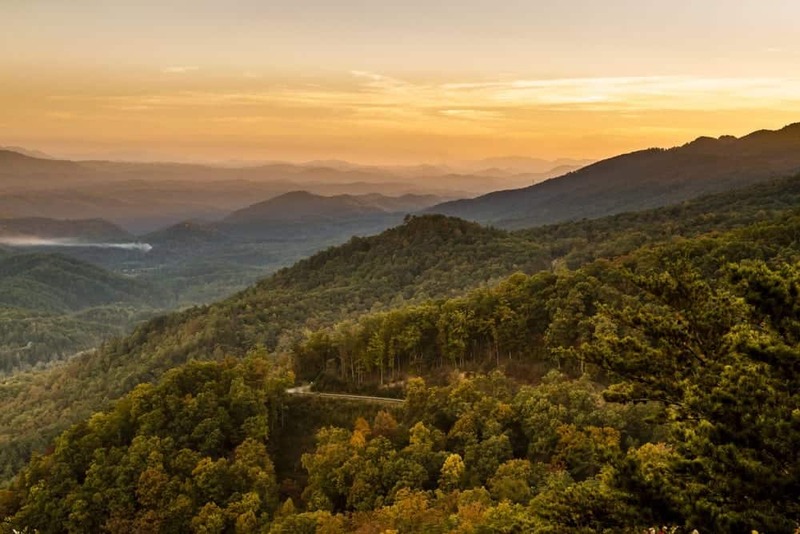 When you stay with Aunt Bug’s Cabin Rentals, you can enjoy the gorgeous vistas from Foothills Parkway West. Our cabins come with your choice of excellent amenities, including hot tubs, mountain views, theater rooms, game rooms, and swimming pool access. With everything from 1 bedroom cabins to 8 bedroom cabins, we are sure to have the perfect property for your getaway. To start planning your vacation, browse our selection of cabins in the Smoky Mountains!